Home > Food > The delights of eating jellyfish. Here’s a BBC interview I did about the pleasures of eating jellyfish. After the main tour, I spent a week in Yunnan on a reconnaissance mission for next year’s inauguralYunnan food tour. Both 2015 tours are already sold out, but I believe WildChina will be opening bookings for 2016 in the next month or two. While I was in Chengdu in March, I found myself staying in the same hotel as Michelle Obama for a couple of nights. Despite our proximity, I didn’t catch the slightest glimpse of her, although the hotel restaurant was swarming with White House people during her stay, and I was penned in at the side of the road outside the hotel one evening while her imposing motorcade swept past. As you can imagine, the question at the top of my mind was: of all the possibilities, where are they going to take the First Lady to eat?! 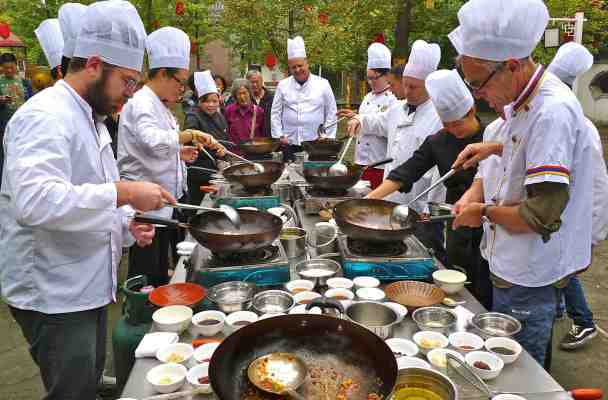 In the end, according to newspaper reports, the organisers settled on two restaurants: a Tibetan restaurant, and a hotpot restaurant. And while I fully understand the reasons for choosing a Tibetan restaurant, and love the riotous fun of eating hotpot from time to time, I’m sorry that Mrs Obama didn’t also have the chance to enjoy a more typical Sichuanese meal. 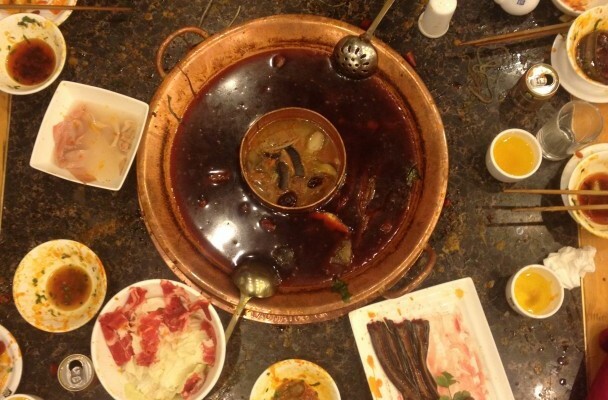 Hotpot, after all, despite being a fun experience and an example of the mala (numbing-and-hot) exuberance of Sichuanese cooking, is hardly a showcase for the broader cuisine in all its dazzling variety. For those of you who don’t know Sichuan hotpot, it’s a simmering potful of oily broth seething with whole chillies and Sichuan pepper, in which diners can blanch or boil their own raw ingredients. Often, and usually when foreigners are present, the pot itself is divided into two, with one half spicy and one half filled with a mild, chilli-free soup, so that diners can alternate between the two or avoid the fiery heat altogether. As to the dipping ingredients, although you can dip virtually anything into a hotpot, the highlights for local people are slithery, rubbery, and bouncy delicacies such as tripe, goose intestines, rabbit kidneys and even chicken testicles – none of which are likely to be top of the list of likes for an American party on their first trip to China. Anyway, my own mild disappointment at the gastronomic itinerary was nothing compared to the consternation provoked by the menu served to members of the Obama household at one of their dinners in Beijing, if this report on the Economic Observer website is to be believed. American officials in Beijing wanted to arrange a private dinner for the Obama party and their friends, according to the article, and, naturally enough, selected the wondrous Da Dong restaurant, which specialises in Peking Duck, braised sea cucumber and a flamboyant cocktail of traditional and modernist Beijing cooking. You cannot, after all, go to Beijing without eating Peking Duck at least once, can you? According to the article, when the restaurant manager told the eponymous head chef, Da Dong, one of the most famous and esteemed chefs in China, that the Obama party was intending to visit, Da Dong asked him to recommend some of their finest dishes to the US Embassy officials in charge of the dinner. The US officials, however, tactfully declined the offer of assistance in designing a menu, and insisted on going their own way, saying they knew the restaurant well and just wanted to order a few ‘comfortable’ dishes. Da Dong, the article explains, was exasperated at the obtuseness of the officials, whom he said might have had the chance to taste his famous sea cucumber and turtle dishes themselves, but were intending to deny Mrs Obama the pleasure. ‘At least add some sea cucumber to the menu, please!’ he groaned. A few days later, the Embassy’s chosen menu was sent over – it was, as the Economic Observer helpfully explains, one that any ordinary Chinese person would view as weird and conservative. Apart from the roast duck, there were two beef dishes (stir-fried beef with white leek and chopped beef with black beans and chilli), two Gong Bao-flavoured dishes (chicken and shrimp), and two dishes that included bamboo shoot as an ingredient – which is far too much repetition by Chinese menu-planning standards. ‘The other dishes were just a bunch of vegetables such as beanthread noodles, eggplants and broccoli,’ the report says. And in Chengdu, it goes on, the chosen hotpot menu was equally circumspect, omitting any goose intestines, pig’s blood or ox throat cartilage [!]. Instead, the Obamas just ate meatballs with cilantro, Australian beef and another bunch of vegetables. The author of the report doesn’t seem exactly to disapprove of these choices – he goes on to explain that they were in keeping with the known preferences of Mrs Obama, with her White House vegetable garden and her overhaul of White House menus to favour fruits and vegetables over doughnuts and the like. But one can sense the exasperation that local chefs felt at being denied the chance to show Mrs Obama what they considered to be the finest dishes they could offer. On the other hand, would Mrs Obama actually have enjoyed Da Dong’s signature Braised sea cucumber with white leek (葱烧海参)? Possibly not. I have had a high degree of success at persuading participants in my China food tours to try sea cucumber and enjoy it, and I adore this dish myself – it’s magnificent. If you’re going to try sea cucumber in China, I tell my innocent victims (! ), Da Dong really is the place to do it. But I do accept that appreciating such textural delicacies can be a challenge for the uninitiated. This whole story reminded me of a newspaper report I read during former Chinese president Jiang Zemin’s state visit to London in 1999, which mentioned in passing that the president had arrived at Buckingham Palace with a boxful of instant noodles and other emergency Chinese food supplies! One can only imagine the poor man, after an evening politely eating pink roast lamb, roast potatoes, Stilton and that sort of thing, retreating to his room for some proper Chinese food, eaten out of a disposable plastic bowl with disposable chopsticks. As the English saying goes, ‘one man’s meat is another man’s poison’…. Back to the Obama party’s dinner at Da Dong: the Economic Observer seems to have the whole inside story. Apparently the Americans loved the black bean beef so much they ordered another serving. But Da Dong, whose braised sea cucumber really is one of the restaurant’s crowning glories, and who is so proud of it he has made it the logo of his restaurant, was in the end unable to restrain himself – he acted like the finest host and sent out a sea cucumber to every guest at the table. We will perhaps never know what the Americans made of them. The only sad thing is that, according to the report, Mrs Obama herself was so fatigued by her punishing tour schedule that she didn’t join the other members of her family for the Da Dong dinner. Perhaps she was having a caesar salad in her hotel instead.